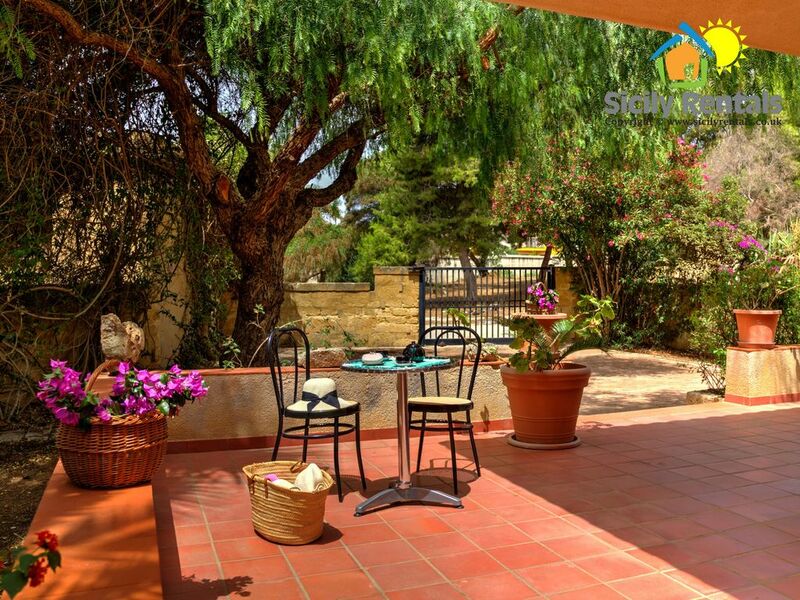 Located in the rich territory of Sciacca, famous for its precious ceramics and for its elegant spa, this spacious villa is the ideal solution for those who want to spend a beach holiday without turning down visiting places of significant artistic and cultural interest. The villa has 3 bedrooms, two bathrooms with shower, a large living room, a kitchen and large outdoor areas all organized to offer to its guests the maximum relaxation at different times of the day. You can relax on the hammock under the shade of the beautiful palm trees that adorn the lush Mediterranean garden surrounding the villa, or sitting in the shade of the veranda reading a good book or dining outdoors during the warm summer and spring evening, enjoying the equipped barbecue area. The house also has an outdoor shower, very convenient when you return from one of the many beautiful beaches in the area; it is moreover equipped with wi-fi and private parking in the shade. The proximity to places of historical interest and beautiful beaches make this villa the ideal place for your holidays! Sciacca is a city in the province of Agrigento, famous for its numerous churches, its Carnival, the baths and the pottery. Sciacca has many points of interest and its urban structure, consisting of closed neighborhoods between walls, derives from the Arab and Norman dominations. Sciacca is rich in religious and military buildings. The Church of Santa Margherita, used for exhibitions. The main entrance is Catalan, its interior is baroque. The Enchanted Castle, composed by heads and statues carved in the rocks by a peasant artist, Filippo Bentivegna, who gave them names so that they could represent an imaginary kingdom. The main square of Sciacca is Piazza Angelo Scandaliato, in the city center where there are the church of San Domenico and the Palazzo di Città. It is also connected to the municipal garden, characterized by the presence of fig trees, palms and plane trees that frame the square. In addition, the place offers a wonderful view of the sea and the port and, during the days of low tide and in the absence of haze, you can see the island of Pantelleria on the horizon. Sciacca is also famous, in Sicily and in Italy, for its Carnival, one of the oldest in the nation (probably dating back to Roman times). There are six days of celebrations with impressive allegorical parades and wagons built many months before by the local population. The atmosphere is full of colors, fun and gaiety. Traditionally, Peppe Nanna, symbolic mask of the carnival of Sciacca, opens the celebrations by donating sweets, sausages and wine.